In March 1718, the HMS Phoenix arrived in New Providence carrying the King’s Pardon, and among the first to sign was none other than Blackbeard’s former commander Benjamin Hornigold. Hornigold arrived on the scene as a privateer before the island of New Providence became a pirate haven and attempted to continue his legitimacy as such by claiming to only attack French and Spanish ships, well after official privateering rights were revoked. By 1716, he was rising in the ranks of the growing pirate community on the island, and the origins of many later pirates can be traced back to his crew, including Blackbeard. This perhaps inaccurate assertion that he attacked no British ships was called into question by several authorities. Eventually Hornigold seemed to change his behavior to fit his claims, keeping his crew from capturing profitable British merchantmen that passed. Inevitably, in the summer of 1717, his crew grew weary of missed opportunities and Hornigold was deposed as captain, spending the rest of the voyage as a mere passenger while his former crew attacked British ships. 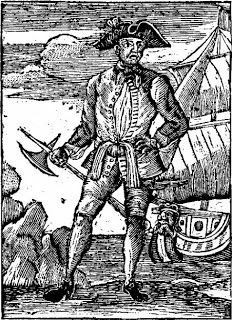 Quickly losing authority over a pirate community in which he had held much esteem, Hornigold returned to New Providence, arriving about the same time as news of a pardon. Hornigold had a reputation, at least among the British government officials who he would ally with, of being more mild than his counterparts who joined up as piracy was becoming a cutthroat business. The passenger of one vessel he captured noted “they did us no further injury than the taking most of our hats from us, having got drunk the night before, as they told us, and toss’d theirs overboard.”1 This reputation gained him favor with the new Bahamian governor Woodes Rogers, who after Hornigold’s surrender, commented that he was “glad of this new proof Capt. Hornigold has given the world to wipe off the infamous name he has hitherto been known by, tho in the very acts of piracy he comitted most people spoke well of his generosity.”2 Hornigold went from being one of the top pirate captains to Rogers’ top pirate hunter, going after die-hard Charles Vane, capturing the merchant-turned-pirate captain John Auger, and scaring Vane’s comrade “Calico” Jack Rackam into surrendering to the King’s Pardon, at least temporarily. 1-Quote from passenger journal, quoted in Earle, Peter. The Pirate Wars. New York: St. Martin’s Press, 2003, p177. 2-“Dec. 24. Nassau on Providence. 807. Governor Rogers to Mr. Secretary Craggs.” In Calendar of State Papers, Colonial Series, America and West Indies, Volume 30, 1717-1718. London: His Majestey’s Stationary Office, 1930. -Earle, Peter. The Pirate Wars. New York: St. Martin’s Press, 2003. -Konstam, Angus. Blackbeard: America’s Most Notorious Pirate. Hoboken, NJ: John Wiley & Sons, 2006.